I forgot I already replied earlier to this with pictures, but, what the hey, you have the one with Kennedy, now, too. Here is a photo of President Kennedy with a model which may have been the one your husband's grandfather built and went on to the American Express Pavilion. We have one of the models with a clear dome on it that traveled the country as well. Besides the Hall of Science I understand the Queens Museum of Art has one, too. Ours is on display in Seattle and in my picture on this website I am standing by it. Three photos of it are attached, two with the dome on it and myself in one of them and one with my assistant Dean and the dome off of it. Was it at a World's Fair? was it at a worlds fair? Here are two pictures from my collection of the LaGuardia Field with the China Clipper, which had service directly to the 1939 Golden Gate International Exposition. 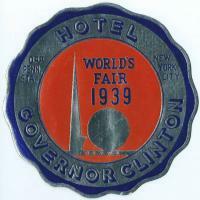 This is an odd request, but does anyone know of any kind of souvenir, collectible from world's fairs that might be interactive? I know some people looking for something like that. something they could put on display and let others get involved with it. The World's Fair Historical Society offers Season's Greetings from the world's fair - an original card from the San Francisco 1939 Golden Gate International Exposition. I have run across some science fiction novels with world's fairs as a topic, and thought I would share that. Science Fiction author Robert Silverberg wrote, "Regan's Planet" about a man who builds a satillite orbiting earth that will have a world's fair in it, and the sequel to it, "World's Fair 1992," about a kid that wins a contest and first prize is to work at the world's fair in the Mars Pavilion. They were written in the 70's so dated but fun. Pictures of these are below. There is also one about a superhero of sorts at the 1939 NY Fair and when I find that I will post it. I have a poster in my collection advertising the book. I actually have a poster, two sided, printed for this world's fair that never happened. One side shows a map of the proposed location and the other is a big ad for the fair. Probably part of their early promotions for the fair to the BIE. Or if it was a spaceship ready to take off . . . The World's Fair Historical Society is happy to say we were able to help Tricia and sent items to them that they used in their exhibit.